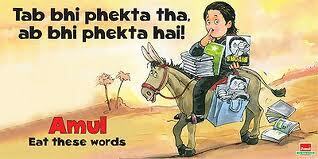 Amul ads have always produced a smile and the occasional guffaw. The men behind these witty and satiric ads have been Bharat Dabholkar and Sylvester da Cunha who have been in the forefront by creating Amul ads since the 80s. Incidentally this is the longest running ad campaign ever and seems to be getting stronger and wittier by the day. 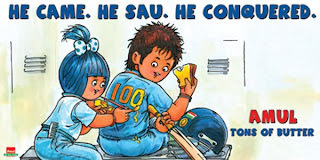 The one on top is a clever tribute to the maestro Sachin Tendulkar after he completed 100 international hundreds earlier this year. The clever use of 'sau' in place of 'saw' and the inevitable 'tons' in the tab. The cute Amul girl is seen adding the extra 0 to his already famous '10'. Undoubtedly a master stroke, befitting the monumental achievement of an Iconic player! he won his second term to the most powerful office on the planet. Quite obvious, but acknowledging a very significant event in the world in an openly appreciative manner. Cheteshwar Pujara gleefully tucked into the English bowling and came up unbeaten on both occasions, with a double century, to boot. Alistair Cook performed well too with a big hundred and a fighting knock in the second essay. The heroes of the test. 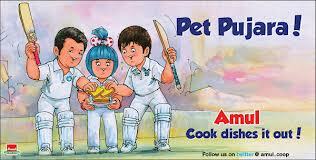 Pet indicates the tummy and the clever play of 'cook' to include Alastair Cook of England. was nothing more than a 'chucker'. No wonder, Amul ads continue to be the longest running advertisement campaign of the world. The brand is firmly entrenched in the minds, nay, the hearts of the people. The most successfull story in the field of brand promotion!